Forget about the Apple glass cube. This store has been presented today at the Santa Monica Planning Commission by some "ASB/Blatteis Promenade Holdings, LLC". Who could be the actual retailer? There's only two possibilities here: Apple or Apple. The proposed one-story, 34-foot high commercial building will feature an expansive floor-to-ceiling height accentuated by a transparent glass ceiling. The front façade will consist entirely of transparent glass panels that will project five feet from stone paneled side walls. 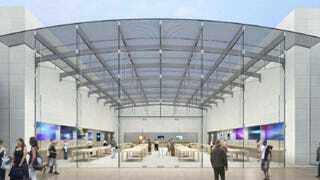 Apple already has a store nearby, but this one is going to be a bigger one, so it may be a replacement.